Love tacos but bored with the traditional taco? If so, check out this delicious recipe from our great friends over at IMUSA. It looks absolutely delicious and I can't wait to make it. 1. Make slaw by mixing the first five ingredients until smooth and then mixing it with the cabbage and mango. Set aside. 2. Mix paprika and polenta together in a shallow bowl. 3. Season tilapia strips with salt and press into polenta, making sure it's completely covered. Discard excess polenta. 4. Heat 1-2 Tblsp. of olive oil in your IMUSA non-stick sauté pan and once it begins to smoke, add the tilapia. Fry the tilapia in batches, about 2-3 minutes per side, until slightly browned and fully cooked. Remove onto a paper-towel lined dish. 5. 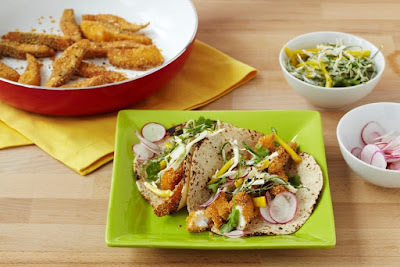 Heat corn tortillas in the IMUSA tortilla warmer and serve fish tacos. 6. Assemble by placing some slaw in the center of the tortilla and one or two slices of tilapia on top. Top with cilantro leaves and radish. I love this idea of using cornmeal to bread the fish. It then would go especially well in a corn tortilla. The mango adds a nice sweet touch to the recipe.